Early January 1987, I had sort of settled into my Kyoto boarding house. It was lonely and the other boarders weren’t all that friendly. Even though there were other English speakers, there were no other Americans that I could find and so I pretty much kept to myself. I would eventually realize that non-Americans were really quite wonderful to hang out with. Unfortunately, none of the fun or outgoing “gaijin” resided at the boarding house. I had my interview at the English School, passed with flying colors and was excited about my first teaching assignment. The night before my first class, I was scheduled to meet Blue Eyes for dinner in the town of Yamashina, where his company was located. He was supposed to meet me at the train station at 5:30pm and we would walk to his favorite beef stew restaurant about a 1/2 mile away. In Japan, many of the older style restaurants are very small and specialize in one type of food like tempura or sukiyaki. A good workmate of Blue Eyes’ had treated him to this little restaurant and he was excited to introduce me to it. I got off the train at about 5:20pm. It had started to snow earlier in the afternoon and it was quite beautiful, but cold when I walked out to the front of the train station. Blue Eyes was not there, but I was a little early. One of the reasons for our meeting up, besides the fact that I missed him terribly and was thrilled to spend a meal with him, was that his good friend who taught at the same English School, had written out directions to my first teaching assignment and I would need those to get to my class the next night. I waited outside the train station as it grew colder and the snow came down heavier. By the time 30 minutes had gone by, I started to get worried. Blue Eyes had always run late, but this was ridiculous. I had been in this country for less than two weeks and I did not really speak the language. How could he leave me standing here like this unless something was drastically wrong. There was a pay phone close by, but I had no idea how to use it. I did have some coins on me and I went to the phone and somehow managed to get an operator. In Japanese, I asked if she spoke English. There was a big pause so I just blurted out the name of the company Blue Eyes worked for. I was miraculously connected to one of the company’s receptionists who thankfully spoke some English. I asked if I could speak with Blue Eyes, but she said he was unavailable. I explained that Blue Eyes was supposed to have met me at the train station 45 minutes before but he had not arrived and I had no idea if he was going to be arriving. She kindly gave me directions to the company and said I could wait for him there. I walked the few short blocks to the building and was greeted by three young Japanese women. They sat me down and brought me some hot tea. They then stood behind their receptionist desk and whispered to each other with their hands in the front of their mouths while looking in my direction. I can only assume they were talking about me. Blue Eyes was the only non-Japanese person working at the headquarters of the company at that time. No doubt he was quite the oddity and now here I was, an uncomfortable female foreigner soaking wet from the snow and shivering wondering what the heck was going on and literally feeling like an alien (gaijin, means foreigner in Japanese, or literally, alien). I’m sure they knew a lot more about me than I knew about them, which was nothing. Blue Eyes had worked there for four months now. He had even gone sightseeing with some of the women. I honestly felt incredibly uncomfortable and out of place, but this would end up happening quite often while I was in Japan. After waiting about 15 minutes, Blue Eyes emerged with his boss, K-san. Blue Eyes introduced me to his boss who smiled big and seemed to be a very nice man. I am sure Blue Eyes brought the boss out in order to temper my mood, which I am sure he assumed was less than pleasant, and he was correct. At dinner Blue Eyes explained that there had been an unscheduled meeting called at 5:00pm. Employees are not really given the option of whether they will stay, or not. Blue Eyes of course had remembered that he was to meet me at the train station, but he didn’t know what to do as the meeting went past 5:30, and then on to 6:30pm. 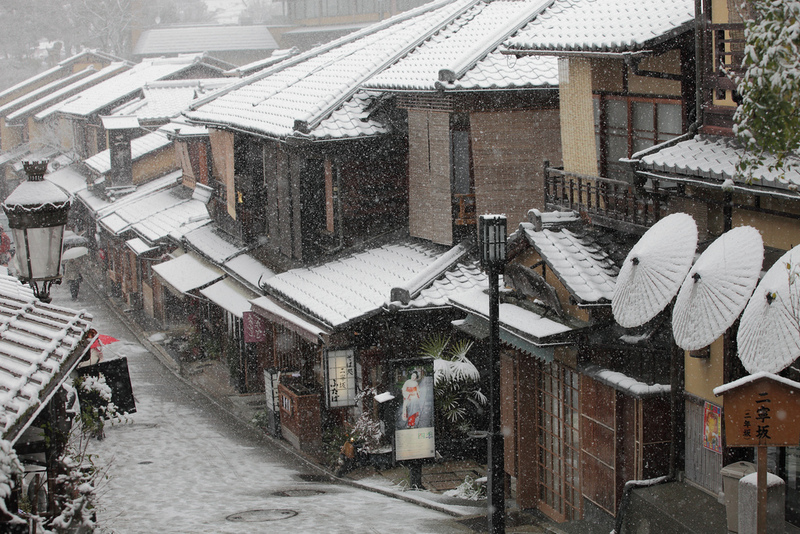 I suggested maybe he should have been honest with his boss and explained that he was set to meet me, a foreigner with no Japanese skills and that I would be standing there alone in the snow. Maybe they could have sent one of the receptionists to get me… one of the lovely girls who was just standing around whispering the whole time I was sitting there. Surely one of them could have walked the short distance up to the train station and escorted me. It seems Blue Eyes didn’t really want to talk any more about it as my mood was not improving the more we talked. If it had been me, as soon as the meeting was called, I would have explained the situation to see if there was an equitable solution. As it was, I managed, because I really had no choice and I am resourceful like that, but I didn’t really want to have to. This would be one of the first indicators that not only was Blue Eyes completely whipped by his parents, but apparently he was completely inept at communicating when it came to any type of authority figure or putting my needs first, ever. I just do not live in that world. People are people and leaving someone standing at the train station is disrespectful, especially under the circumstances. What were they going to do, fire him if he said he needed to take a 10 minute break to run up to the train station to get me? 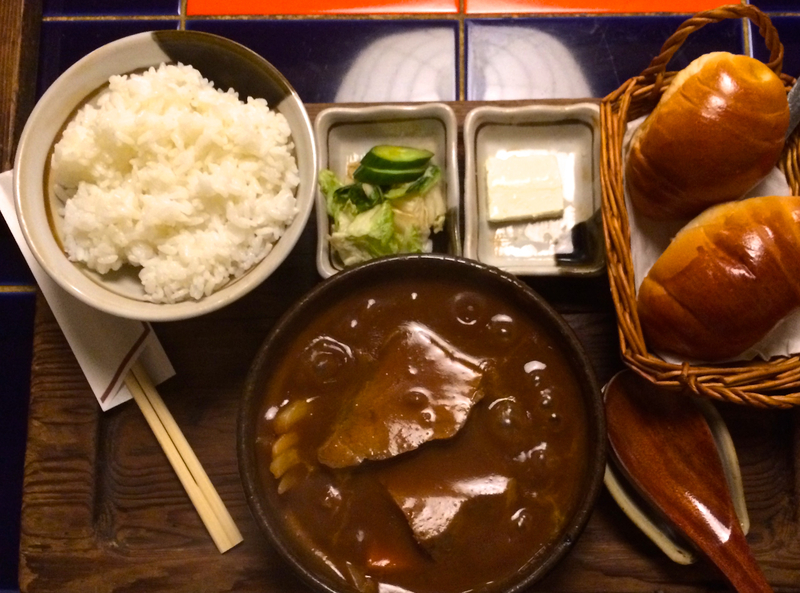 Dinner was great though because there is just nothing like a steaming hot bowl of rich beef stew after being left out in the cold at a train station in Kyoto, Japan. On a cold night in January 2015, almost 28 years later, Blue Eyes and I sat in that very same restaurant and enjoyed another bowl of beef stew together (pictured above). The restaurant is still owned by the same family and in our honor, they played Michael Jackson and Madonna and stood close to our table smiling at us the entire time. Back in 1987, during dinner Blue Eyes explained the directions to my teaching job the next night. It all seemed to make perfect sense to me. Blue Eyes walked me back to the train station and I made the trek back to my cold, lonely boarding house room by myself. The next afternoon was another snowy one. I decided to give myself a little extra time to get to the school. I was really lamenting the fact that I did not have better shoes and I knew boots would need to be one of my first purchases once I received a real paycheck. As it was, I was wearing the only decent closed toe shoes I owned and they were thin and flimsy. Because it was so cold, I decided on leggings and a sweater even though I had been instructed to wear a skirt or a dress. At least I had a decent wool coat and gloves. I walked to the train station near the boarding house and was careful to choose the trains and tracks included on my detailed direction sheet. I was very glad I had given myself extra time, as everything seemed to take longer than expected. As I boarded the last train that would take me to the little town where the night’s lesson was scheduled, I figured I had just enough time to get to class considering it was a bit of a walk from the station and my shoes were already soaked through. Not fun, but doable. My lesson was scheduled at 7:00pm and I knew the trains would be crowded with commuters on their way home. We were packed in tight, but I only had a couple stops before they called mine. As the train approached my stop, it did not slow down, it zoomed right through the station and that is when I knew I was in trouble. I was on an express and I had no idea how many stations I would pass before this train stopped again. I started to panic as we sailed through one, two, three, four train stations without even slowing. Finally, the train stopped somewhere out in the middle of nowhere. I quickly exited the train and ran to the nearest station attendant. I blurted out the name of the town I needed to be at like 15 minutes ago and he quickly rattled off the name of the train I needed to be on. I thanked him profusely in Japanese as I ran to the other side of the track. Thankfully, my train showed up in less than five minutes and I was soon heading back in the right direction. I once again studied the map that would get me from the train station to the school. I couldn’t believe Blue Eyes’ friend had given me the wrong train information. As I exited the train station, I was planning on running to the school, but as I looked out from the brightly lit station and watched dozens of people spilling out onto the streets with their umbrellas (of which I had none) I saw that the snow had really picked up. There was at least 4-5 inches on the ground and it was still snowing, hard. I thought I would cry, but I choked it back. I tentatively stepped out onto the street to gauge how quickly I could travel in the conditions and suddenly I heard someone with a thick Japanese accent say my name. How strange to hear your name being called when you are in a country thousands and thousands of miles from home where you can count the number of people you know on one hand. I looked around to see Blue Eyes’ boss, K-san, heading toward me with a big smile on his face. His English was passable and I explained my predicament. He understood and ironically, the English School was one block from his house. He handed me his umbrella, which was nice enough, but I was already soaked through, and he quickly escorted me right to the door of the school. I thanked him bowing about two dozen times and rushed inside. I am sure I was quite the sight. It was my first teaching assignment, I was 10 minutes late (an absolute miracle I was only that late), I was quickly unbuttoning my sopping wet coat to expose my inappropriate attire while looking around desperately for something to dry my hair with. The ladies behind the front desk were horrified. They didn’t mince words. The sweet Japanese female demeanor was gone. One of them quietly yelled at me. I tried to explain, but they would have none of it. I dropped my head as she escorted me to a room down the hall. She opened the door and there sat two young business men in suits. When they saw me, they quickly jumped up, bowed, and tried to help me with my belongings. The lady who had taken me to the room apologized to the men, looked at me in disgust and promptly left. I honestly had no idea what to do. If I had arrived sooner, I would have had time to quickly review the lesson plan for the night. This was my first teaching assignment after all… I was clueless. I settled in my chair and looked up to find two men staring expectantly at me. I wanted to disappear. Thankfully, in order for students to qualify to have a native English speaker as their teacher, they need to have passed numerous exams and be able to converse to some degree in English. They are actually not allowed to speak Japanese. They also pay quite a premium to be taught by a native speaker. In the case of these two 30 year old salarymen, their company would be paying. They turned out to be my favorite students of all. They requested me over and over and I “taught” them once a week until they left for the states. They were being temporarily positioned in Austin, Texas. A city I had never been to, but that didn’t stop them from asking me dozens and dozens of questions about it. What was the public transportation like? What was the best bar to pick up American women (I kid you not)? What do American woman like as a gift for their first date? The Japanese love to give gifts. Even though we had a set lesson plan each week designed to improve their speaking skills, their English was actually quite good and we ended up chatting freely for about half of each two hour session. What they wanted was a culture lesson. When time was up, they didn’t want to leave. The first session, after my late entrance and less than stellar appearance, I thought surely they would complain about me to the school and I would never see them again. But in fact, they became quite attached to me. I researched all their questions about Austin the best I could (without such fancy things as the Internet). As it turns out, I got along very well with all my students and it was actually the easiest most enjoyable job I have ever had. Japanese people love learning English in a relaxed and conversational environment and I love to talk, and listen, and it all worked out and I made a lot of money. What turned out not to be so fun for me, however, was living apart from Blue Eyes and specifically living in the boarding house. I hated it. I avoided the landlady, I despised having to cross the street in the middle of the night, in January, to use a Japanese style toilet. I loved the area of town, but my room was bitter cold and teeny and lonely. I was lonely. After a couple weeks, during my weekend meet up time with Blue Eyes, I told him I didn’t want to return to the boarding house and I would not be staying in Japan. That I had come to Japan to have the experience with him. I had not come to have the experience by myself. I did not like my living arrangements and even though I was loving teaching English, that was just a job. I wanted to experience the country, sightsee, eat the foods with him, stroll the old shopping streets with him, visit the shrines, and temples, and castles and experience traditions with him, sleep in the same bed with him. That if I couldn’t be with him more, I felt I should just return home and finish my undergrad degree. We could see how things went and meet up again when he came back to the states for Law School. Blue Eyes panicked. He decided he didn’t want me to return to the states. In a matter of days, he had figured out how to get us a small one bedroom apartment. He enlisted the help of friends and he had to borrow the equivalent of $5,000 US from his mentor, Asa, in order to do it. Deposits on apartments in Japan are outrageous. When Blue Eyes really wants something, he will stop at nothing to get it. At this point he wanted me, in Japan. By the end of January we were living in our own brand new little apartment, right off the main train track line in an area of Kyoto named Fushimi-ku. Glad I could put you to sleep, LOL. 🙂 . I will probably be writing more of these as I am doing quite well and no need to post about sadness and pain all day, thankfully. No it is quite nice to post about something other than infidelity, I find that too! I love reading about Japan, I think it’s because it’s so otherworldly. You did put me to sleep, but in the nicest possible sense – please keep the posts coming!